timber entering markets. It asks two related questions: How important a timber source is forest conversion? 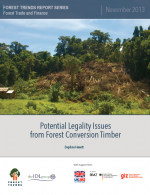 And what are the sources of potential illegality associated with timber from forest clearance? appropriately regulated as other channels. conversion from undermining such initiatives.